FIU has been awarded a grant to continue stewardship of the Aquarius Reef Base, the world’s only operational underwater research center. As a member of the Cooperative Institute for Marine and Atmospheric Science CIMAS, FIU received a grant to continue maintenance and monitoring of the facility for NOAA in 2013. This will enable FIU to develop a new business model to fund operations at Aquarius. 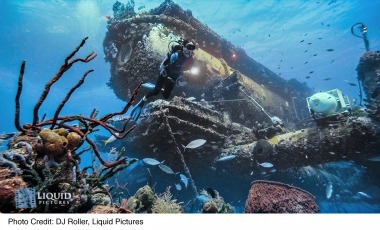 NOAA’s National Undersea Research Program, including Aquarius, was not included in the president’s fiscal 2013 proposal, however, NOAA recognizes that the Aquarius Reef Base is a unique and valuable asset to the scientific community. The new business model would include research and education activities supported by federal, state and local government funding, as well as fees for services from science and engineering teams from government and industry that use the facility. Donations from private benefactors also will be a key to ensuring the future of Aquarius. A photo of Aquarius can be found here. FIU biology professor Jim Fourqurean is the director of the Marine Education and Research Initiative for the Florida Keys in SEAS, and he will be overseeing activities at Aquarius Reef Base. The existing Aquarius team will become FIU employees. Aquarius provides unparalleled means to study coral reefs and the ocean, test state-of-the-art undersea technology, train specialized divers, and to engage the imagination of students and the public across the globe in ocean science, coral reefs, conservation, and underwater technology. The undersea lab even offers training opportunities for astronauts headed to space. “Living and working in Aquarius is perhaps the closest thing on earth to actually being in space,” said William L. Todd, program manager for Exploration Analogs at NASA’s Johnson Space Center. Todd commanded the first-ever NASA Extreme Environment Mission Operations (NEEMO) at Aquarius in 2001. NEEMO is a joint NASA-NOAA program to study human survival in the underwater laboratory in preparation for future space exploration. “Aquarius allows our astronauts to conduct unique undersea missions that closely resemble the tasks, timelines, operations and even spacewalks that will be conducted on long duration space missions,” Todd said. Wow. It has a dual purpose. Monitoring the sea and training astronauts. Can people breathe in the Aquarius? I’m not sure how many people realize this but this is a really big deal! FIU is now operating the world’s ONLY underwater research center! Think about how much this is going to do for the university, as well as the world! That’s right. And I haven’t seen anything about it on the cable news. The amazing expansion of scientific and social research at FIU is awesome. In less than 40 years, I have witnessed the University’s growth from a tiny campus at Everglades edge, to a magnificent City of Higher Education – a place where ideas explode into reality. Where there are no bounds toward helping to solve mankind’s questions. (OK – that’s a bit over the top, but I sure am proud of FIU) Golden Panthers Forever! Why not rent it out as the ultimate diver’s vacation hotel, presumably for the somewhat wealthy? They could dock their private submarines outside the base and have tea and crumpets, wine and cheese, or any other combination of rich-people foods their hearts desired… all while helping to keep the base alive and functional! It’s a beautiful pic. Like the Nautilus. Or something from the movie 20,000 Leagues Under the Sea. Btw, how many leagues is this base under the sea? I don’t know if anyone saw this but last night on ABC’s Nightline, they feastured Sylvia Earle, who is battling to save the underwater lab, the Aquarius, and sound the alarm on overfishing. Based on the article above her efforts paid off. FIU stepped up to the plate with the needed funds. Thanks for the link. The Aquarius doesn’t look that beautiful in the video though. FIU needs to spruce it up. Thus, making it look worth saving and getting more donations to help the fish. I really think that FIU should put all its efforts into saving this important lab. Forget building more buildings on the campuses and put all the money toward the lab.